On today's episode of MBC Section TV's , the crew visits Park Shin Hye and Jang Keun Suk on a photoshoot set. 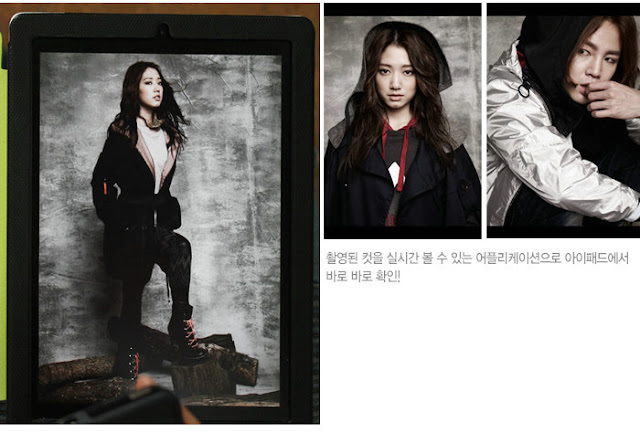 The two friends are seen doing a photoshoot for Korean fashion label 'Codes Combine Haiker Fall/Winter Collection 2011'. To that, Shin Hye replies 'Yes Jang Keun Suk's mother likes me a lot. When we first met, she held my hand and said that she hoped I could be her daughter-in-law.' Shin Hye holds Jang Keun Suk's hand to demonstrate how his mother previously held hers. The interviewer gave them king and queen crowns and told them to pose together. 'However, my ideal man is actor Won Bin,' Park Shin Hye says earnestly. when will be hong ki's turn?Miss Anjell! wow. she likes won bin! hahaha. im so happy! JKS's mother loves psh! spazzzzzzzzzzz to the highest level!!!!!! when i first heard the news, i never thought that this is recent - i thought 2-3 years ago news which is being talked about. i'm not a shipper but i love these two young people. and i love to see the happiness in their faces and actions. after almost 3 years, i had never seen sukkie as genuinely happy as this. and shin hye, dear girl we just love you heaps. such beautiful beautiful person inside and out. keep on smiling. your detractors are not worth even a second of your worry. The incredible chemistry between these two are unexplainable. I agree this look for shin hye is really pretty. This is for winter so the background is a bit darker than the color we are so used to seeing her in. No wonder guen suks mom can tell that these two are a good match!! why jang geun suk said that kim ha neul girl is much prettiest.' he cant see that park shin hye is the only beautiful person in this univeres..................! Sukkie came back from Japan to shoot this show.So exciting! i managed to get the interview online n after hearing it, i think its the reporter that asked isnt park mentioned she preferred Won Bin? Then JGS said sthing abt the actress in the pet movie. My korean isnt good but i think i can still differentiate who said that? I'm a woman, I love Park Shin Hye. The more I know about her the more I adore her and I like any guy who treats her well. I like Jang Geun Suk because he is genuinely good to Shin Hye.